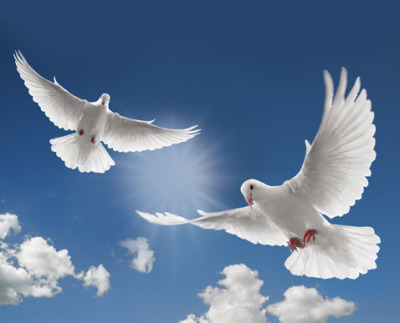 The process of a dove release is really quite simple. The birds (which are pure White Homing Pigeons) will be released by opening a container at a specified time during your event. These birds have their own natural built in GPS system which guides them back home from as far away as 1000 miles. However, we are careful not to ask them to travel more than 60 miles from home to ensure their safe return. You choose how many doves you would like released (usually between two to twenty) and we will deliver them in a beautifully decorated crate from which they may be released by simply opening the lid. The birds circle overhead for several minutes as they orient themselves towards the direction of home. Then they will simply fly home as a flock.